My beloved, local hardware store–yes I do mean beloved–emailed me an offer I just can’t refuse. This is the place I can find everything I need for my old house and then some. They are the romantic Five and Dime for the DIY set. I should only visit them with a list and just enough cash to cover the listed items, otherwise, I’ll spend double the amount I intended. And no, it’s not Target. Why it’s brilliant: The two Frattallone’s on Grand Avenue in St. Paul (yes TWO!) are surrounded by small turn-of-the-last-century houses. These not-so-big houses have teeny, tiny garages in a city where it’s nice to keep your car off the street in the winter. 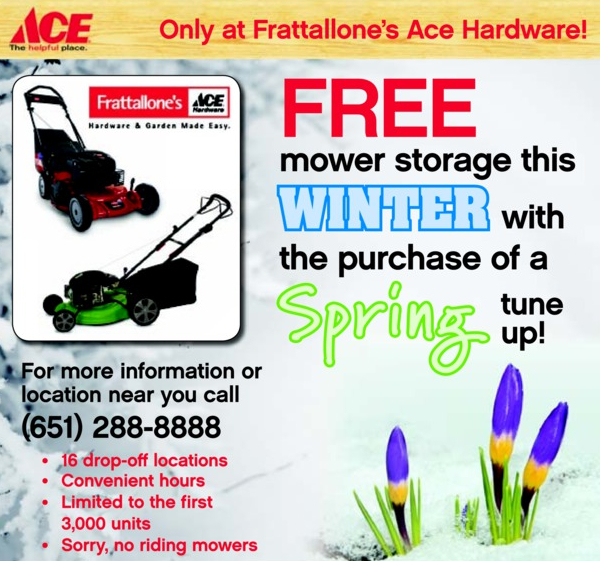 The consumer problem they solve: Safe storage for your lawnmower where it’s not in the way of your car, snow shovels, snow blower, golf clubs, and bicycles. Their big win: Revenue and reservations for the busy lawnmower tune up season. Good for them. They should make some marketing efforts towards Macalester students next fall when the new students check in. I redirected several of them to Frattallone from their intended destination of Target. Hi Sara Geneva Noreau Kerr, what an informative blog. Keep up the good work!